Beautiful Family House on Clean Sandy-Bottomed Crooked Lake! Crooked Lake is a part of the famous Inland Water Route - a route of beautiful lakes and rivers connecting the Great Lakes. It is spring fed, has a sandy bottom and crystal clear water. There are marinas to rent boats and water toys, good fishing and a big sandbar famous among the locals as the great place to play. There are great skiing options for winter travelers as well. Our cottage is in Oden, MI. It has a swimming area shallow enough for children yet deep enough at the end of our dock for just about any size boat. The dock is solid, steady, and has a large area on the end for playing, docking a boat and sunbathing. Beach towels are provided. On the main floor is a clean, well-kept, open floor plan and a master suite. The living room houses a wood burning fireplace, game table (games & puzzles provided), and comfortable seating. The kitchen is fully outfitted, stocked with good flatware, cutlery and cookware - including the extra cooking tools and serving pieces you’ll need for large family meals at the dining room table. The main level front porch has a table for eating and relaxing, and two of the second floor bedrooms have access to the veranda. The beds are clad in 600+ thread count linens that are replaced each season. Each bedroom has an air conditioner, but up north, you’ll seldom need them. A discreet housecleaning service will make a midweek visit for clean up. A laundry room right off the kitchen with an extra large washer and dryer is available to use. With so much to do, you'll be tempted to stay put. But limitless opportunities await you outdoors. The cottage resides in Oden, and neighboring Petoskey and Harbor Springs are home to a variety of shopping, dining and recreation activities. 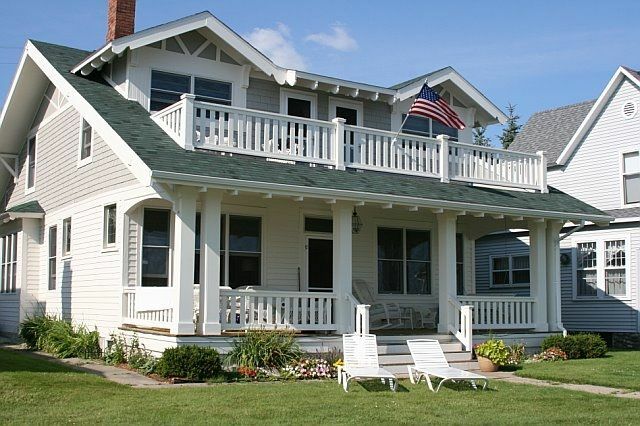 High-demand destinations like Charlevoix, Mackinac Island and Bay Harbor are also not far. You are within minutes of some of the area’s several world-class golf courses, great fly-fishing locations, and beautiful ski slopes. The cottage is right next to the new 60 mile rails-to-trails path that runs between Charlevoix and Mackinaw City - perfect for bikers, runners and hikers. And right outside the front door is Oden's famous lakefront lighted walkway. Clearwater Cottage on Crooked Lake is an amazing place! This summer, my kids and I spent a week at the Clearwater cottage on Crooked Lake. It was an experience that will last our lifetimes! We spent the majority of our time on the lake, which is an absolute gem - clear, clean water and a sandy bottom! We rented a boat and went all the way from Crooked Lake to Lake Huron (Mackinac Bridge). The Inland Water way was gorgeous. On our excursion, we played on Burt Lake and Mullett Lake. We also stopped at unique local restaurants on the lakes and rivers during our trip. The water quality, scenery, and hospitality along the way was superb! The Cottage was clean and roomy. Plus, it was centrally located to all the other areas we wanted to visit - Petoskey, Harbor Springs, and Charlevoix. We will definitely be returning to this very special place! Wonderfully maintained cottage on a peaceful Crooked Lake. Our extended family of 12 found plenty of space to gather and play in small groups or all together. A well provided kitchen allowed for easy meal preparation for all, although we did explore some of the area restaurants. The cottage was within easy access of many of the other recreational opportunities of the area. I think the kids will be talking about this trip for many years. We have already recommended the cottage to friends who do similar family getaways. We enjoyed our stay very much. The cottage is very well decorated. Also very well equipped and welcome pack that was very much appreciated.. The only downside of this property is its location which is on the US Hwy 31 ,which is very busy and sometimes the whole cottage shook. I don't think this was mentioned when I picked this cottage. It was such a shame because it looks onto the beautiful lake which is supposed to be very relaxing but the highway noise in the background spoilt the tranquillity. This is a great retreat in a lovely spot on Crooked lake. The house was perfect! Very clean, warm and welcoming. 5 bedrooms , 2.5 baths was plenty for three couples plus some weekend guests. Very close to adorable towns of Petoskey , Harbor Springs , Charlevoix, and only 20-30 minutes to the ferry . It was very convenient. Location is for family fun! Our family met from all over the U.S. for a reunion here and had just a terrific time. Perfectly set up, clean, great access to the lake, made this an easy and comfortable stay. Short drive to Petoskey and Harbor Springs when you wanted to go into a town. The lake is beautiful and all ages had fun swimming, sunning or taking our boat out. Just down the road was Ryde Marina where you can rent boats, kayaks and canoes. Highly recommend this cottage! The 5 bedrooms make it a great place for a group. We are open to a shorter stay during the high season, and offer weekend ski rates as well during the winter. Contact for details.